443. Helene Schjerfbeck, "Vårbroddens madonna" (detail). Bukowskis can proudly present seven lots exceeding one million SEK along with high final prices on both Art and Decorative Arts after this seasons final hammer auction. Helene Schjerfbeck’s masterpiece ”Spring Madonna”, one of the Important Winter Sale's highlights, was the auction’s most expensive lot sold and the art work achieved, after a withdrawn bidding, an incredible final price of 7,962 500 SEK. - Yet another successful year for Bukowskis has come to an end with a fantastic result for the auction Important Winter Sale. Bukowskis dominates Fine Art and we are strengthening our position as the leading auction house in Scandinavia with new record sales and international relevance, says Louise Arén, CEO. The auction’s first day included several art works from some of our time’s most prominent Swedish masters such as Anders Zorn, Carl Larsson och Bruno Liljefors. Two fine examples are Anders Zorn's painting ”Sandhamnseffekten”, which was sold for 2,327 500 SEK and Carl Larsson’s ”In Montcourt”, an incredible art work from his time in France, that achieved a total price of 1,960 000 SEK. 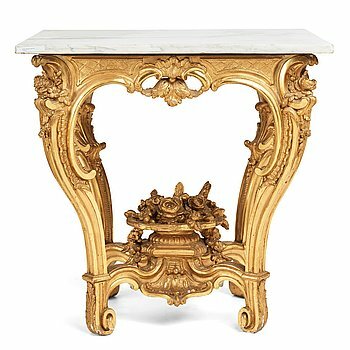 – The auction had a great international interest and the final prices reflects that quality always sells. Art and Decorative Arts in fine condition is still demanded by our customers and we are very proud over the auctions fantastic results, says Björn Extergren, Head of Consignment & Sales Department. Another success was the sculpture ”Serpentine dancer” by Carl Milles, inspired by the American dancer Loïe Fuller, a magnificent bronze piece that reached a fantastic final price of 637 500 SEK. – Stunning masterpieces sells for sensationally high prices and it was very satisfying that we managed to achieve a new record price for a from the El Greco suite, by Helene Schjerfbeck, says Andreas Rydén, Head Specialist, Art. 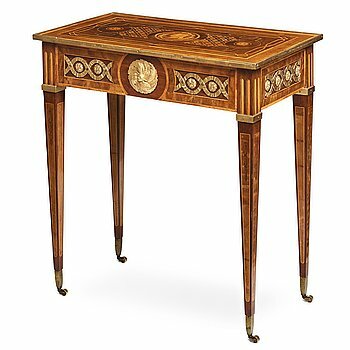 A delicate Gustavian late 18th century table, by Georg Haupt, achieved a sensational final price of 2,450 000 SEK, a result that shows that high quality craftsmanship is continuously demanded. Jöns Efverberg’s master piece got a great deal of attention, along with a royal table, once belonged to Queen Lovisa Ulrika (1751-1771), which reached a final price of 171,500 SEK. – Unique objects with character and history are always in demand. 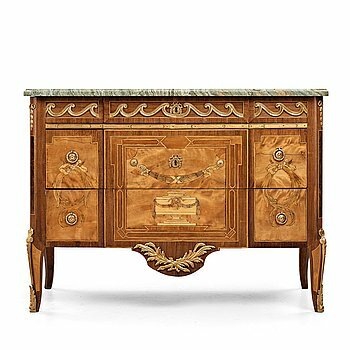 A French Baroque Bureau Mazarin is another magnificent example which achieved an exceptional final price of 214 375 SEK, says Henrik Åberg, Specialist Furniture and Works of Art. The auction’s second day began with the Asian department which included several surprises and energetic bidding from Swedish and international bidders. The department offered two incredible lots that ended well above the estimates, a large iron-red and gilt ”dragon” charger from the Qing dynasty which achieved a final price of 294 000 SEK and a blue and white dish with a Yongzheng mark that ended at a final price of 245 000 SEK. 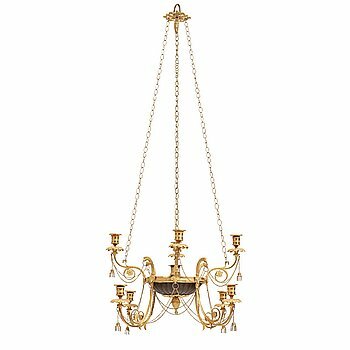 The silver department offered several high final prices, including an early 18th century silver breaker by Christian Hennings, sold for 104 125 SEK, and a pair of silver candlesticks by Pehr Zethelius from 1780, which achieved a final price of 183 750 SEK. The interest in gemstones was high when the jewellery department presented a rich selection of sparkling diamonds. A unique ring from the Swiss jeweller Paul Binder reached a sensational final price of 357 500 SEK and a ring set with two old-cut diamonds ended on a final price of 306 250 SEK. The department’s top lot was an eye-catching platinum ring with a Colombian step-cut emerald that achieved the incredible final price of 477 750 SEK. 6. 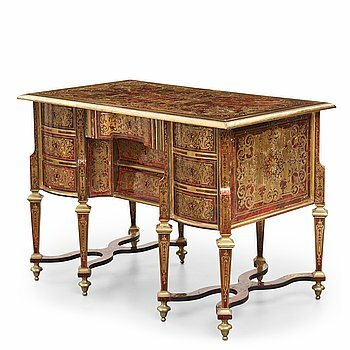 A French Baroque Bureau Mazarin desk, circa 1700, circle of Nicolas Sageot (1666-1731). 9. A Swedish Royal Rococo mid 18th century table, belonged to Lovisa Ulrika (Queen of Sweden 1751-1771). 11. 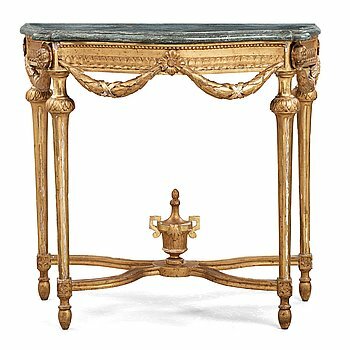 A Gustavian late 18th century console table. 29. A Gustavian late 18th century table by Georg Haupt (master in Stockholm 1770-1784), not signed. 44. JÖNS EFVERBERG'S MASTERPIECE, Stockholm 1775, Gustavian commode. 45. 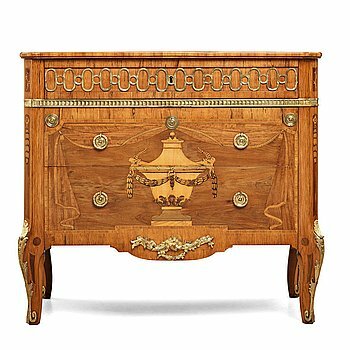 A Gustavian late 18th century commode by Niclas Korp (master in Stockholm 1763-1800), not signed. 80. 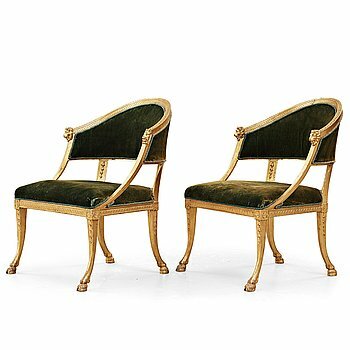 A pair of late Gustavian armchairs by Ephraim Ståhl (master in Stockholm 1794-1820). 118. A late Gustavian early 19th century nine-light hanging-lamp. 198. 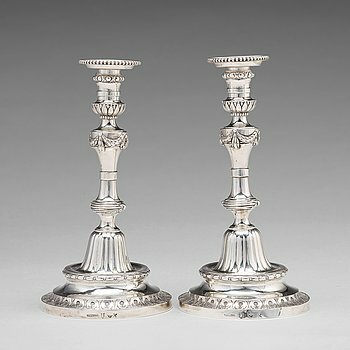 A pair of 18th century silver candlesticks, mark of Pehr Zethelius, Stockholm 1780. 267. A CARPET, an old Isfahan, ca 347 x 252 cm (+ the ends have 3 and 2,5 cm flat weave). 295. Märta Måås-Fjetterström, A CARPET, "Rutig blå halvflossa", knotted pile in relief, ca 304 x 209,5 cm, signed AB MMF. 351. Karl Nordström, A glimpse of the ocean. 358. Stefan Johansson, "Sommarkväll" (Summer evening). 366. Jenny Nyström, Bringing the Christmas presents. 367. Jenny Nyström, The New Year. 398. Bruno Liljefors, Common Eiders. 400. Bruno Liljefors, Northern goshawk attacking black grouse. 401. Carl Larsson, "Havreskärning II"/"Havreskörd II" (Oat harvest II). 403. Carl Wilhelmson, "Strandlandskap" (Fiskebäckskil med Lysekils kyrka) [Beach scene from Fiskebäckskil with the church of Lysekil]. 415. Carl Milles, "Serpentindanserska" (= Serpentine dancer). 416. Carl Milles, "The Wings". 425. Johan Johnsen, Still life with, fruits, lobster and a goblet. 429. SCANDINAVIAN ARTIST, around 1620. Young girl with a goldfinch. 430. Ulrica Fredrica Pasch Attributed to, Monarchs and Regents of Sweden, 13 portraits. 431. Ola Billgren, "Restaurantträdgård, Locarno". 434. Lena Cronqvist, "I Badet". 435. Ola Billgren, "Hommage à Robbe-Grillet". 443. Helene Schjerfbeck, "Vårbroddens madonna" ("Spring Madonna"). 448. Jenny Nyström, Elegant lady Christmas shopping. 449. Hugo Simberg, The wood chopper. 453. Carl Larsson, "Vila" ("Rest"). 455. Carl Larsson, "Brudtärna" / "Ateljéinteriör" (Bridesmaid / Studio interior). 461. Alexander Roslin, Unknown lady in a blue dress. 502. Johan Niklas Byström His studio, Baigneuse. 506. Gustaf Fjaestad, Winter landscape with ski tracks. 517. Per Krafft d.ä., "King Gustav III" (1746-1792). 524. Bruno Liljefors, Winter landscape with black grouse. 533. Ola Billgren, "Interiör Sofielund". 554. Carl Milles, "Skridskoprinsessan" (=The skater princess). 556. Marino Marini, "Piccolo cavallo filiforme". 557. Carl Larsson, "I Montcourt" (In Montcourt). 587. Gustaf Fjaestad, Moon reflecting on water, scene from Lidingö on the outskirts of Stockholm). 587A. Helmer Osslund, "Vårstämning, Sollefteå" (Spring in Sollefteå, landscape from the northeast of Sweden). 608. A large blue and white Transitional vase, 17th Century, Chongzhen (1635-44). 641. A copper alloy figure of Buddha Shakyamundi, Tibet, 17th Century. 694. A Sino-Tibetan gilt copper alloy figure of Ushnisha Vinaya, late 18th century/circa 1800. 760. A nephrite bowl, Qing dynasty, circa 1900. 868. A large iron-red and gilt 'dragon' charger, Qing dynasty, with Guangxus mark and of the period (1874-1908). 944. A blue and white dish, Qing dynasty (1644-1912). 964. A Paul Binder ring with a modified radiant-cut diamond ca 7 cts quality ca Light Yellow vvs-vs.
973. A Demi parure comprising a necklace and a pair of earrings set with rubies and old-cut diamonds. 1013. A ring set with two old-cut diamonds with a total weight of ca 4 cts quality ca H vs.
1039. A platinum ring set with a cabochon-cut emerald ca 7 cts and brilliant and baguette-cut diamonds. 1107. A platinum ring set with a Colombian step-cut emerald and old-cut diamonds in a fitted case from Cartier.